How often have you stopped simply to listen to the world around you? Indeed, how often have you actually listened to yourself? Admittedly, against the constant background drone of an urban society this can sometimes be hard to manage. Noise, bright lights, the rush of the city – these things are the trappings of our modern life, so much so that we easily forget the pleasure of natural silence. Generally we tend to lead fairly discordant lives, this displayed by our clumsiness and our clatter as we go about everyday tasks. People are always shouting to be heard, firing out opinions like automatic weapons, slamming doors and stamping feet, like petulant children demanding attention from the adults in the room. Always noise. And what is any noise but a disruption of the endless flow of silence? Silence is the base. Silence is the foundation. Silence is the formlessness from which all form manifests. It is this silence that we aspire to. Not the passive hush that comes from doing nothing, but the powerful and active silence that results from true mastery of one’s art. It is important to understand that it is not just being quiet for quiet’s sake: it has a purpose. That purpose is to improve and refine your control over your physical abilities. Moving silently means moving with absolute precision as well as with constant awareness of your body. You must be choosing how much noise your footsteps and movements make, not letting mere chance decide. For a good example, observe a cat moving about a house – its every step is measured, its landings are controlled, and all needless sound is avoided. Cats move with perfect control. 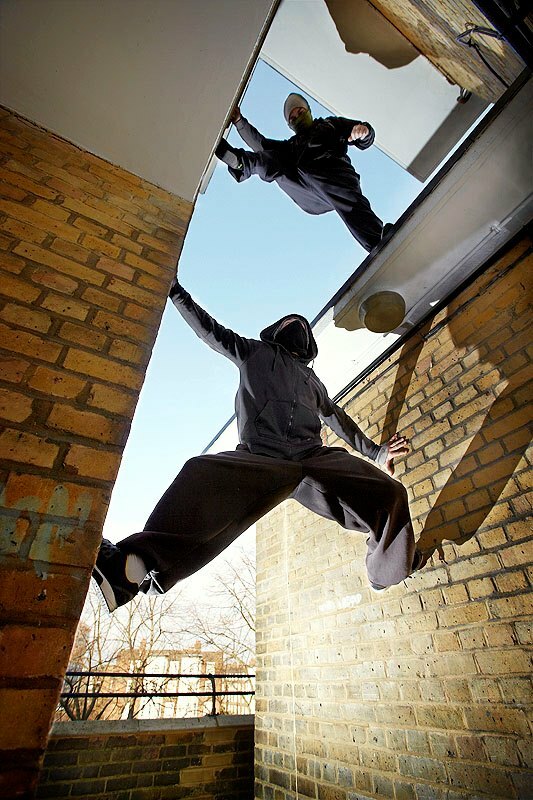 However you want to move, whatever path you choose to take, stealth must be a core component of your practice of parkour. Every aspect of your game will benefit from being able to do it with less noise, quietly… stealthily. So while you train, listen to your movements. A loud landing is a heavy landing. Think about it: in general, the softer the impact the less sound it generates. Hit someone with a pillow and then with a piece of 4-by-2 and you’ll get the picture. If you want to be able to practise up unto a ripe old age, it is imperative that you minimise the impact your body and joints receive. If you can land quietly, you can be fairly sure the impact is negligible. As with everything, the key is to start small. Try dropping off a bench, or a table, but simply try to do it silently. This is where technique and refinement will assist: land on the balls of your feet first, then the foot may go flat and you will begin absorbing the energy through the muscles of your legs as you sit back and down into it, similar to a good squat position. Do this until you can land without noise, poised to move on immediately – then up the height as your technique improves and your strength grows. Then try it with precisions. Then with rail precisions. And it isn’t just in landings that we can incorporate the principles of stealth. Listen to your footsteps when you walk or run: are your feet crashing down like buckets of cement with each step, flat-footed and heavy? If so, time to go back to basics and learn to walk properly my friend: Heel-to-ball-to-toe. Flex the ankle. Energy should be directed forwards, not up and down: always think efficiency. Try to keep your head at the same height when walking or running. Be balanced, not tipped forwards or leaning back. Relax the muscles. Be stealthy, like a stalking cat. Flow, even when you walk! Herein lies self-mastery. All motion involves a collusion of many muscles. In crude terms, the more muscles you can engage for any one movement, the more power and control that movement will have. Isolation is inefficiency. Learn to think of the body as an undivided whole, for that is exactly what it is. Our musculatures are symmetrical as well as sympathetic: tense your right bicep and up to 20% of that tension will be reflected in your left one. Improve the grip of one hand by clenching the other at the same time. You will see that the muscles of the body are all interconnected on many levels, and none of them works alone. Understanding this can help you greatly improve your economy of effort within any movement. This brings control, and this in turn will bring silence. Look at a decent boxer’s punch: it isn’t just the arm, or even the shoulders that give it that dynamic speed and power. A whole array of muscles is involved, from the toes and lower leg through the hips and torso and then lastly the shoulder and arm. This is known as muscle recruitment, and it applies across the board for all sports and physical activities, and no less for parkour. A poor landing, for instance, is one in which the impact is managed predominantly via the bones, joints and connective tissue of the knees and lower legs. The relevant muscle chains are not recruited effectively into the action, and the resulting heavy jolt will shock the spine and have negative effects upon the entire skeletal structure. And it will be loud. A good landing, however, will disperse the impact through the whole body as all the muscles work to support each other, much like the ribs of a coiled spring. Such a landing will be soft, graceful and controlled. And it will be quiet. One of the best methods for developing your stealth, and hence your muscle control, is to practice what are affectionately known as ‘Stealth Runs’. These are effectively uninterrupted periods of movement, over any terrain, often at night, wherein the goal is simply to move as quietly and efficiently as possible. Speed is not important here, nor particularly are aesthetics. Just move, interact with whatever comes your way, but always do it silently. If training with others, monitor each other’s noise levels, see if you can hear the one ahead and the one behind – and if someone is too loud, let them know about it with a definite ‘shush’. The concept of a Stealth Run is not to sneak about, but rather not to draw attention to yourself. The aim is to move fluidly and in harmony with your environment, such that people simply do not notice you are there because you are not generating any stimuli that their senses might pick up on. This is a great way to train your body as well as your immediate spatial awareness, and it’s great fun too. Try it: but try it quietly. No matter how loud our everyday environment is, we all have the ability to fashion our own silent space within it. Not only does moving quietly enable you to master your own movements, it also greatly improves your ability to observe the world around you, just as you can listen only when you are not speaking. This improved observation helps us find harmony with our surroundings, which in turn helps us move through them with ease and grace. And the benefits of silence stretch beyond the physical arena as well. You will find as you progress through stealth training that the endless discourse within your mind begins to fade into the background, allowing pure concentration and focus to come to the fore. You will find that you become free from any distraction, inner or outer. Free to move. Let others make noise; we can learn to make silence. You’re most welcome! Many thanks for your kind feedback!